For this stage, CE and ALL child site information must be verified. Each CE has 2 designated contacts, Authorizing Official (AO) and Primary Contact (PC), who have access to OPAIS and are responsible for completing the recertification process. Only these 2 contacts have access to OPAIS; so be sure the AO and PC are aware of the recertification protocol and are engaged, timely, in the process. Any required documentation needed during recertification can now be uploaded in PDF or Excel format. Previously, only email documentation was accepted for recertification. Failure to provide the required documentation, will prevent completion of the recertification process which will lead to removal from the 340B program. Listed AO and PC are accurate. This should always be kept up to date as the AO and PC are the only contacts who receive correspondence from HRSA regarding the program. Addresses of CE, child sites and contract pharmacies. Local/attesting government official. Please note, this can not be the same person as AO or PC. Medicaid carve-in/carve-out designation. For carve-in sites, verification that the Medicaid Exclusion File (MEF) is populated with Medicaid provider numbers or NPIs must be completed. DSH percentage and that it meets the applicable qualification thresholds. DSH percentages from the latest Medicare cost report (as-filed or amended) should be used for the current recertification. Consult with your finance and/or reimbursement department with DSH percentage questions. Child sites are listed as reimbursable cost centers on the Medicare cost report. The compliance component of recertification must be completed by the AO. Hospitals must confirm that they will comply with 7 attestations regarding 340B program compliance requirements. Before attesting, the CE should confirm they have policies and procedures, systems and internal audit protocols to maintain compliance with program standards. All information listed in the 340B database for the covered entity is complete, accurate, and correct. The covered entity meets 340B program eligibility requirements. The covered entity will comply with all requirements of Section 340B of the Public Health Service Act and any accompanying regulations including, but not limited to, the prohibition against duplicate discounts and diversion (section 340B(a)(5)(C) of the Public Health Service Act). The covered entity maintains auditable records pertaining to compliance with the requirements described in paragraph (3) above, pursuant to section 340B(a)(5)(C) of the Public Health Service Act. If the covered entity uses contract pharmacy services, that the contract pharmacy arrangement will be performed in accordance with OPA requirements and guidelines. 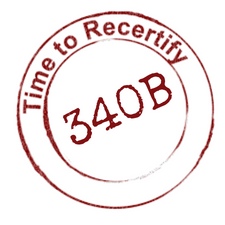 The covered entity acknowledges its responsibility to contact OPA as soon as possible if there is any change in 340B eligibility and/or breach by the covered entity of any of the foregoing. The covered entity acknowledges that if there is a breach of the requirements described in paragraph (3) that the covered entity may be liable to the manufacturer of the covered outpatient drug that is the subject of the violation, and, depending upon the circumstances, may be subject to removal from the list of eligible 340B entities.